This handcrafted pottery is inspired in the spirit and tradition of Jewish ritual and will be a beautiful gift for your host and hostess at Rosh Hashana. 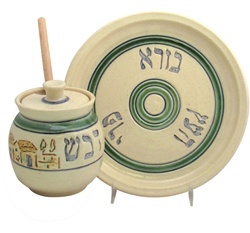 This honey jar and plate (wood dipper included) is designed in cream and embellished with colorful glaze decoration and writing. This will become a family keepsake.